All his life, Jack Lee '17 wanted to make a difference. He always thought he'd take up philanthropy after building a successful business. 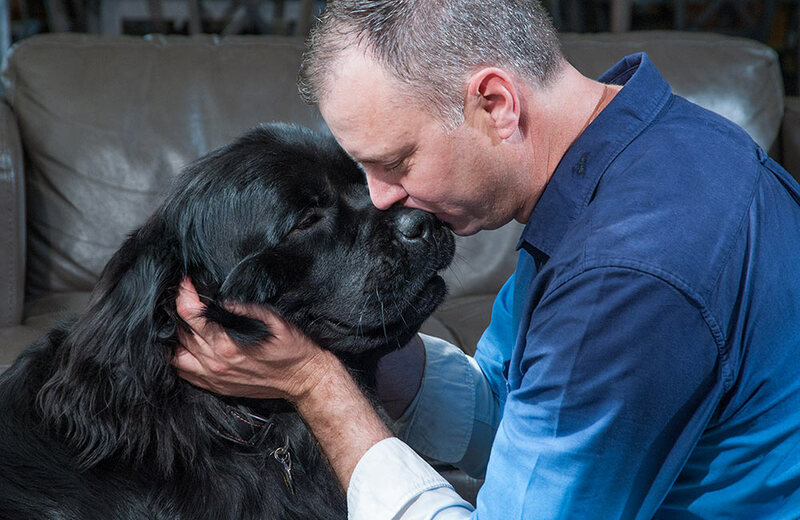 But after he was discharged from the Coast Guard with service-connected PTSD in 1996, life took a different turn as he began experiencing symptoms that were at times debilitating. 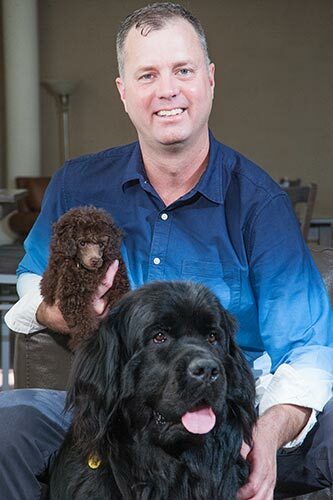 During that time, one of his only sources of solace was his dog, a Newfoundland named Oolum. Lee didn't know it then, but his early trauma would give way to a personal transformation. Lee enrolled at St. Scholastica in 2013 as a non-traditional student — both his age and military experience set him apart from the larger student population. The headwinds increased when Oolum passed away shortly after he started school. But instead of sending him into a spiral, the circumstances narrowed his focus. "As part of my undergrad, I took a research class with Professor [Shelly] Richardson, and I asked if I could do my research on animal-assisted therapy," said Lee, who earned his Bachelor's in Social Work. "I did meta-analysis research on existing materials, studying the effects of this therapy across different populations." Lee discovered that animal-assisted therapy has numerous health benefits for all people, including reductions in anxiety, stress and depression. For Lee — someone who'd experienced firsthand the sense of inner peace that his own dog facilitated — it was the confirmation he needed to begin work with certified therapy dogs. He purchased Nova, another Newfoundland, and became connected with Solvay Hospice House of the Miller-Dwan Foundation. At Solvay, Lee and Nova now spend Wednesday afternoons lifting the spirits of residents and family members alike. "I think [hospice is] a really vulnerable time, not only for the resident, but for their family and their friends," Lee said. "And that's where [Nova] has been really effective in providing comfort and support for the family members and staff." This summer, Lee began a internship at Essentia Health, where he works in two units: adult partial hospitalization and intensive outpatient programming (IOP). Nova is allowed to join him for IOP, and Lee has many stories of her profound impact. "One day I brought Nova into group, and someone who struggles with mental illness was overly anxious and unable to relax — not talking," Lee said. "Nova walked over and they began petting her — I noticed them steadily relax and begin engaging in group discussion." Lee is working toward his Master's in Social Work, and expects to graduate in winter 2018. He sees a doctoral degree in his future, too. Beyond that, he hopes to work with FEMA or the American Red Cross, bringing animal-assisted therapy and psychological first aid — emotional and cognitive coping skills — to survivors of traumatic events. Now, filled with purpose, Lee has one other goal in his sights: getting his new toy poodle, Prince, certified for therapy.